AWARN will deliver multimedia alert content, which could include video, radar images and evacuation maps; text, photographic, or pictorial instructions; inundation maps; plume models for chemical or radiological releases; and shelter locations, treatment protocols, and other recovery information. Television stations that produce their own news and weather programming will have the option of inserting their own clips as additional rich-media elements into the alert. People in harm’s way will have this deeper alert and response information sent via AWARN literally at their fingertips and will only need to open a menu on their device to select the files most relevant to them. 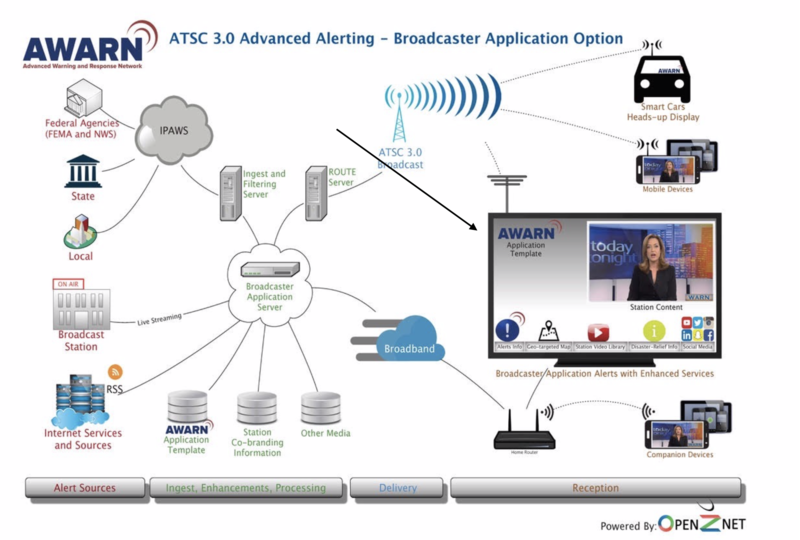 AWARN will have the ability to alert people via mobile and handheld devices because over-the-air broadcast transmission to mobile devices is a key element of the new ATSC 3.0 suite of standards. Cellular networks are subject to failure from a variety of conditions, including overload, when too many subscribers are trying to make calls or stream video at the same time. The cellullar infrastructure also often fails during disasters because of high wind or earthquakes and lack power backup. Generally, broadcast TV towers are designed for more rugged environments and the one-to-many architecture of broadcasting means that it is never subject to overload. Most TV stations have back-up generators to keep them on the air for days. The use of IP allows the new application to be flexible and extensible. Data delivery, non-real-time delivery, and electronic service guides are all included features. AWARN is compliant with the international Common Alerting Protocol (CAP) and designed for full incorporation into the U.S. Integrated Public Alert and Warning System (IPAWS). AWARN provides the technical capability to transmit both multilingual and accessible alerts. Features such as text-to-speech and vibrate-upon-alert for mobile devices, along with all of the rich media content available to users, mean that AWARN alerts will reach many more Americans, including those with aural or visual impairments. Terrestrial broadcasting represents the backbone of an advanced warning and response network that can reach tens of millions of American in times of emergency. Relying on the “dual use” of existing television broadcasting infrastructure, AWARN offers live TV emergency alerts. Its underlying technology of digital television broadcasting can distribute multiple video and other rich media assets to an unlimited number of handheld, vehicular, or fixed receive devices. Of critical importance AWARN and related next-generation technology under development can help meet the disaster communication needs of the public and first responders alike, without placing any bandwidth demand on cellular networks. Sinclair Broadcast Group and LG Electronics conducted the first over-the-air broadcast of AWARN alerting using the ATSC 3.0 standard at the 2016 National Association of Broadcasters convention. The alert was transmitted from Las Vegas’ Black Mountain on Channel 45, under an experimental FCC license obtained by ONE Media, Sinclair’s joint venture, and received with a simple antenna and LG’s new ATSC 3.0 chip tuner/demodulator at the Las Vegas Convention Center. The AWARN Alliance is one of four signatories (along with America’s Public Television Stations (APTS), the Consumer Technology Association (CTA), and the National Association of Broadcasters (NAB)) to the “Joint Petition for Rulemaking Seeking to Authorize Permissive Use of the ‘Next Generation TV’ Broadcast Television Standard.” The joint petition describes the many consumer benefits of Next Generation Television, including the Advanced Emergency Alerting function that enables AWARN. As an example of the value of Mobile DTV, Japan’s mobile television system (1-SEG) provided a lifeline for many people during the 2010 earthquake and tsunami disasters. The 1-SEG Mobile TV system has penetration in Japanese cellphones reportedly greater than 80%, so many people were able to watch live news coverage during and after the disasters, even with cell service down and power cut to homes and businesses. The current Emergency Alert System (EAS) is a national public warning system that has roots in the early days of the Cold War. EAS requires broadcasters, cable systems, and satellite operators to provide capabilities for the President to address the American public during a national emergency. The FCC is the lead agency for EAS. Since the 9/11 attacks, federal agencies have upgraded the nation’s communications capability to respond to man-made and natural disasters. President George W. Bush signed an executive order creating an Integrated Public Alert and Warning System (IPAWS), the FCC has launched the Commercial Mobile Alerting System (CMAS), and President Barack Obama has called for a new public safety communications system for 21st Century America. Public television conducted proof-of-performance testing with FEMA in the mid-2000’s that contributed to President Bush’s issuing of the executive order that created the Integrated Public Alert and Warning System (IPAWS) for the U.S.
AWARN and ATSC 3.0 will integrate seamlessly with the FEMA’s Integrated Public Alert and Warning System (IPAWS.) Alerts generated by state, regional, or local authorities already trigger limited broadcast and text alerts to be received by viewers and listeners. The addition of AWARN Emergency Alerts means that devices equipped to receive AWARN signals can be easily triggered by IPAWS to display video, photos, audio, and text alerts to a variety of specially-equipped devices. AWARN Alert scenarios under development will be available to view in the third quarter of 2016 (by invitation or appointment only) at Sinclair Broadcasting’s WJLA station, in Arlington, Virginia. The demo-alerts, all fictional creations that illustrate real-world emergencies, will showcase the diversity of rich-media content that an AWARN alert could contain. While subject to change, the planned demo scenarios include an AMBER alert, a Tornado alert, a Chemical Spill alert and, an Active Shooter alert. To arrange a viewing of the demos, please contact AWARN Alliance Executive Director John Lawson ([email protected] (703) 347-7070. Please do not contact WJLA directly. AWARN is a powerful new tool for emergency alerting capability that is based on the field-tested and proven M-EAS Mobile Emergency Alert System. AWARN will leverage the higher data thoughput, more robust transmission and improved indoor reception that will be delivered by the emerging ATSC 3.0 next-generation broadcast standard.